Los Angeles may be a figment of its own imagination, but if you long to stand in the footsteps of stars and breathe their hallowed air, you've come to the right place. Disneyland, movie stars, TV, fast-food and hype - it's all here in overdrive. Los Angeles has littered the world with its paraphernalia. If you're not prepared to embrace the dream, you'll doubtless find it filthy, irritating, frightening or just plain dumb. No other city studies itself with such narcissistic intensity. In LA, game show hosts are household names and nobodies erect billboard shrines to themselves. LA beguiles scores of curious tourists, starlit and moonstruck, hopeful starlets and wanna, be rock musicians each day. It's a thriving hybrid, a conglomeration of 88 independent cities sprawling over a vast urban maelstrom. LA is more than the sum total of its mass-produced fantasies. First residents of the Los Angeles area were Gabrieleño and Chumash Indians, who arrived in the desert region between 5000 and 6000 BC. The first European known to have visited the LA basin was Portuguese sailor Juan Rodriguez Cabrillo, who cruised the coast in 1542. 1769: the Spanish governor of California, Don Gaspar de Portola, and Franciscan father Junipero Serra, looking for places to build missions and Christianise California's 'heathen' natives, led an expedition north from San Diego. 21 California missions were established along El Camino Real (The King's Highway), two of them in what was to become Greater Los Angeles. 1781: the missionaries chose 44 settlers from San Gabriel to establish a new town on the banks of a stream about 15km (9mi) southwest of the mission. The pueblo became known, developed into a thriving farming community. They named the settlement El Pueblo de Nuestro Señora la Reina de los Angeles del Río Porciúncula (The Town of Our Lady the Queen of the Angels of the Porciuncula River). 1821: After Mexican independence, many of that new nation's citizens looked to California to quench their thirst for private land. 1830: The prosperous rancheros quickly became California's bigwigs, while immigrants from the United States became the merchant class after the missions had been secularised and a series of governors began doling out hundreds of free land grants, thus giving birth to the rancho system. 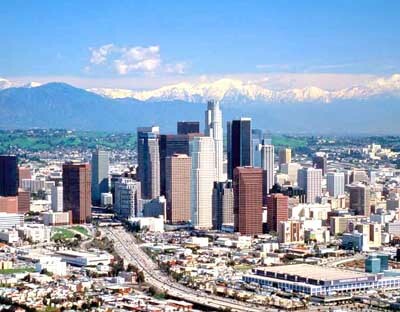 By the mid-1830s, there were still only 29 US citizens residing in Los Angeles. Most Easterners hadn't heard about California until 1840, with the publication of Richard Henry Dana's popular Two Years Before the Mast, an account of his experience plying the hide and tallow trade. 1848: The United States bought all Mexican territories west of the Rio Grande and north of Arizona's Gila River, including Alta California after Treaty of Guadalupe Hidalgo. Ttwo years later California was admitted as the 31st state of the union. Gold was the big push behind this rapidfire recognition; first unearthed near the San Fernando mission in 1842, that find was soon eclipsed by James Marshall's famous 1848 discovery on the American River, which ignited one of the greatest gold rushes in history. Southern California's rancheros were called upon to feed the miners, and they quickly discovered that the new wealth of the mining camps could earn them 10 times the profits they were earning from their cattle. The sudden stampede of tens of thousands of Argonauts (80,000 in 1849 alone, hence the nickname '49ers) had an undeniable impact on LA. 1854: northern California's gold rush had peaked and the state fell into a depression. As unemployed miners flocked to LA, businesses that had harnessed their futures to miners' fortunes closed their doors. Making matters worse for the rancheros was the land commission sent west by Congress in 1851. Los Angeles was an unruly city of dirt streets and adobe homes, plus many saloons, brothels and gambling houses It was incorporated (on 4 April, 1850) and made the seat of broad Los Angeles County. Everyone who had received a land grant two decades earlier was now forced to prove its legitimacy with documents and witnesses. 1857: some 800 cases had been reviewed by tribunal, 500 in favour of the original pre-rancho landowners. When the first transcontinental railroad, the Central Pacific, later renamed the Southern Pacific, was completed in 1869, San Francisco was California's metropolitan centre. The first commercial grove proved so successful that a second crop was established in what is now Orange County. By 1889, more than 5200 hectares (13,000 acres) were planted in citrus. Los Angeles' isolation made it unattractive to San Francisco's robber barons, but a spur line finally reached LA in 1876, just in time to service the upstart southern Californian orange-growing industry. 1900: LA's population had jumped from 2300 in 1860 to 100,000. After a hard-sell campaign, more heeded the advice of crusading magazine and newspaper editor Horace Greeley to 'Go West, young man'. Construction of a harbour at San Pedro, 40km (25mi) south of city hall, began in 1899; the first wharf opened in 1914, the year the Panama Canal was completed, and, suddenly 12,880km (8000mi) closer to the Atlantic seaboard, San Pedro became the busiest harbour on the West Coast. When Easterners arrived, they discovered the downside of living in a desert town with no natural harbour and a woefully inadequate fresh water supply.Bringing drinkable water to the growing city required a more complex solution. In 1904, LA's water bureau superintendent William Mulholland visited the Owens Valley, 370km (230mi) northeast, and returned with plans to build an aqueduct to carry snowmelt from the mountains to the city. Voters approved the plan, and by November 1913, Owens River water was spilling into the San Fernando Valley at a rate of 120 million litres (26 million gallons) per day. The rest of the city's water, as well as Southern California's electricity, comes from dams on the Colorado River, 320km (200mi) east. Today, the daily flow has increased to 2.4 billion litres (525 million gallons). During WWI, the Lockheed brothers and Donald Douglas established aerospace plants in the area, and by WWII the aviation industry employed enough people to lift LA out of the Depression. Population soared to one million by 1920, two by 1930, which had a lot to do with the discovery of oil. A real estate boom, capitalising on the influx of aviation employees, brought capital to the region as well as new suburbs south of Los Angeles. And then there were the movies. Ever since the studios first landed in Los Angeles, the city has raced to live up to the hype created by 'the industry'. That image helped lure two new breeds of immigrant: the eccentric artisan and the fashionable hedonist, drawn by the broad sandy beaches and the temptation of living the Hollywood lifestyle. For decades policy-makers had turned a blind eye to ethnic friction, including the 'zoot-suit riots' in 1943. Despite the economic upswing, trouble was brewing. By the mid-60s, South Central LA had reached the boiling point. The primarily black district of Watts exploded with six days of burning and looting.The bubble burst in August 1965, with one of the nation's worst-ever race riots. The 1990s was a hard decade for LA. Today civic leaders and political activists search for new answers to LA's age-old problems of limited natural resources, economic disparity, rising population pressures and, of course, traffic gridlock. In 1992, racial and economic tensions flared again in the infamous 'LA riots', which cost 51 lives and 1000000000 in property damage, much of it directed at Korean shopkeepers. The surprising number of earthquakes, wildfires, floods and mud slides helped meld Angelenos together in a common cause. A ray of hope came with the city's unified response to the spate of natural disasters that occurred in the 1990s.